STREX was in attendance again at Biophysical Society’s Annual meeting, held on March 2-6 in Baltimore, Maryland. The show was a great success, capturing many conference attendees’ attention with our exciting eye-catching stretching systems, including our automated cell stretching system STB-1400-04 and Microscope Mountable STB-190-XY Stretching System with biaxial stretching. Exhibiting for the first time (and perhaps the biggest attraction) was the STB-150W mounted to the LumaScope LS420 microscope, with attendees noting its compact size and ease of use. 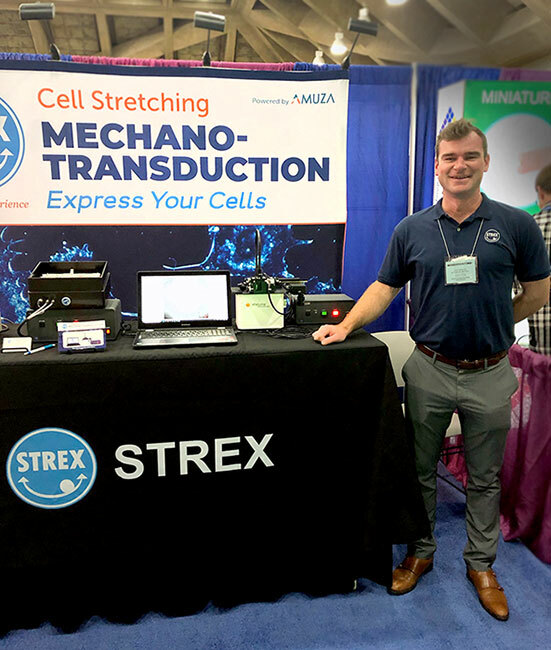 With many attendees sharing how they “do mechanotransduction” or “run tests for gene expression,” we were able to introduce how STREX products are a perfect match for their needs and answer their questions on how STREX can help Express Your Cells. Thank you to everyone who stopped by and especially to those who shared about their research, as it was a great opportunity to learn valuable insights, which always help us help you better. Please contact us here and let us know how we can help you Express Your Cells!